One of the greatest pleasures of returning year after year to Gulu is that I get to watch my students grow up. In 2012, the first year I visited Gulu, I taught a writing workshop where students wrote about pivotal moments in their lives. One of my students, 19-year-old Kobsinge Kamanyire Tausi, wrote about being elected Deputy Speaker for the district wide student government. She was 16 at the time she was elected into office. Here’s what she wrote in her essay, “For All Women,” about that experience. This experience gave me confidence and in the future I want to be the female member of Parliament for my district. I will continue to advocate for gender balance and female emancipation. I will advocate for all women to be empowered even if they have not had the money to attend school. It’s my goal to allocate money to help them create businesses to sustain themselves and their families. I want to be an example for all women in my country. Kobsinge Kamanyire Tausi, age 19. Photo courtesy of Colin Higbee. Tausi speaking at the retreat. Yesterday I was invited to attend a reunion retreat at the school where I taught Tausi and my other very first African student writers. It was no surprise that Tausi was one of the speakers at the retreat. When she spoke, she spoke with poise, passion, and confidence. I had a few moments to sit and chat with Tausi and was overwhelmed with pride when she told me that she’d completed her degree in Human Rights and was now in school for her law degree. She works in the court system in Kampala as a county clerk. Her dream of becoming a member of Parliament is alive and well and seems more and more like a certain outcome. Tausi is one of 20 children in her family. She’s number 17 and to this day is the only graduate in her family. She dreams of using her degrees to fight for human rights, specifically for marginalized women and children. 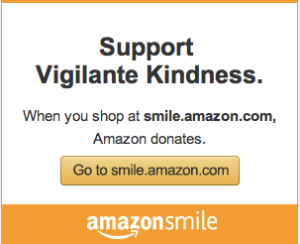 Tausi follows the work of Vigilante Kindness (Hi, Tausi!) and yesterday she asked if I had any groups of girls she could speak to and encourage because she is living proof that no matter your circumstance, if you work hard, your dreams can come true. I don’t have any groups for Tausi to speak to, but I’m confident that after hearing her story, you’re inspired by her. Tausi was and always has been a woman for all women. Kobsinge Kamanyire Tausi, age 25. Fantastic that you are a good inspiration to Tausi.